Brussels' first full-sized electric buses will enter service on 1 October, as the city's public transport operator Stib plans to become 100% electric by 2030. Bus 13 - from Simonis to UZ-Brussel hospital complex - will be the first major route in the capital to use all-electric buses. Four other lines are due to follow in 2019. As well as the all-electric vehicles, Stib has placed an order for 250 hybrid buses. Electric vehicles present new challenges for Stib. Drivers need to adopt a more defensive driving style because the vehicles are almost silent. They also need to drive as smoothly as possible to save and recuperate energy. "All our mechanics, who look after our 680 diesel buses, need to be trained to fix electric vehicles," said Stib director general Brieuc de Meeûs. The electric buses entering service next month have a 16-hour battery life, meaning they can be fully recharged overnight. Other models being considered would be charged throughout the day, at each end of the route. 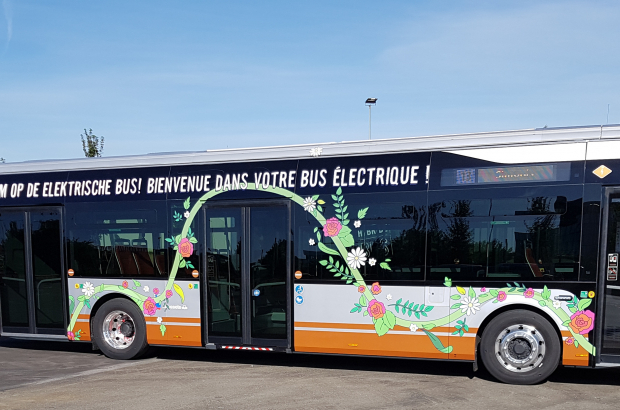 Since June, seven small electric "midi-buses" have been ferrying shoppers between Dansaert and Louise on newly created line 33.